I was so excited to find out I was having a girl! Immediately my dreams of having tea parties and buying dresses seemed more of a reality as soon as the technician said “It’s a girl”. I couldn’t stop thinking of all of the fun girly things I did as a child that now I would get to do with Hallie! One of the things I have been waiting to do with Hallie is use sponge curlers in her hair! To my surprise after bath last night, Hallie sat very still and let me put the curlers in! We got the curlers in in record time, however Mommy probably needs to look up some tips on where and how to place them for next time. Hallie did feel incredibly special in her curlers before bed though. It was pretty cute watching her run around in them letting them bob up and down! Now getting her to sleep was a lot harder than I expected! She kept saying “I can’t lay my head down!” but she didn’t want to take the curlers out because she desperately wanted “Princess Hair” She finally passed out on me around 9:30 and I moved her to her crib. Oh Princess Hallie! You make your Momma’s heart so happy! To see you enjoying all the same things I did as a child brings me so much joy! Did you know that September is Pediatric Cancer Awareness Month? Did you know that only 4% of cancer research budget goes to Pediatric Cancer? I didn’t until I received an email from a fellow blogger telling me about something called Noah’s Bandage Project. Now while my own daughter, oddly hates having band-aids, stickers, tattoos, etc stuck to her skin, I know she is not in the majority. I also couldn’t pass up an opportunity to teach Hallie about giving to other’s in need. So this month on one of our weekly Target trips, I explained to Hallie that not all kids are as healthy as her. That sadly some of them had to spend a lot of time in the hospital. I explained to her about little Noah, and told her what he wanted to do for kids like him. I told her to choose 2 boxes of bandages to send to these sweet kiddos. 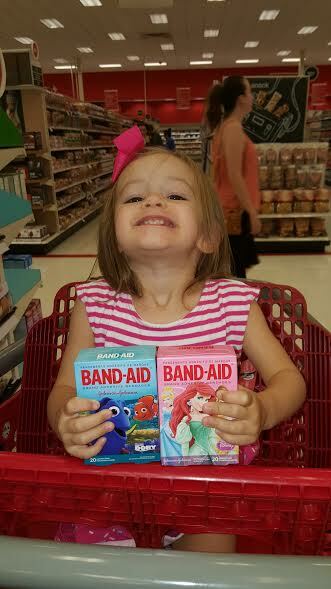 She gladly chose Princess and Finding Dory Band-aids! When we got home I told Hallie to make a little picture to include with our package for Noah’s Mom. She eagerly colored a stickered (as long as they aren’t on her skin, this kid LOVES stickers) a sweet note for Deb, Noah’s mom and we sent out our band-aids! Hallie and I had a great time with this project. I feel that it is so important to teach kids even as young as Hallie to give back to others. This was such a fun and sweet project to be a part of, and I can’t wait to do it again next year! Another one I seriously need to get on video: Hallie will ask for “Other one paci” or “Other one dress” instead of saying I want the other dress or the other paci! Its adorable! I still die laughing every time I think about this one! We were sitting at the breakfast table and Hallie was playing with a Melissa and Doug Cake She took one of the round cake decorations and handed it to me and said “Peace be with you!” She is getting parts of Mass mixed up, but it was the funniest cutest thing ever! I love that she is starting to participate in Church! We were in the car and Hallie asked us some question I can’t quite remember, because just as she asked it she exclaimed “NOT!! !” Where the heck did she learn this!? Everything is happening “Next week” even if she means in 2 minutes! “Mom can I go swimming next week?” “Sure honey” “Okay I get my swimsuit!” Well played daughter! We were about to go to Jimmy Johns with my cousin for Lunch. In the car Hallie started talking to her pony that she brought with her saying “Pony you want to go to Jimmy Johns, okay we can go? Do you want water or milk?” It was so cute hearing her mimic me! She likes to pretend to scare you, but will inform you before she does, so the other day she told her Daddy, “Okay, I gonna freak you out!” Ha! “Mom can I watch little Einsteins” (I ask myself out loud not sure if it was too close to when we have to leave “Maybe, what time is it”) Hallie exclaims “15!” Love her! Can’t wait to experience all of the other cute fun she has in store for us! If you missed out on the rest of her Hallieisms, check them out HERE! Hallie and I just found the cutest thing! It’s another Mail Subscription Service called “Ben the Rooster” and it’s awesome! Ben the Rooster is an adorable Pen Pal for 2-6 year old kids! Ben’s main goal is for kids to learn to enjoy reading! Each Month Ben sends your child 2 post cards for your to read to/with your child. Then the child writes back to Ben with the included response card and stamp. This month Ben asked Hallie what her favorite book was, and if we could share a of it! Hallie wrote back to Ben telling him that her favorite book was “Pinkalicious” and she “drew a picture” of Pinkalicious’s Pink Cupcakes! It was so darling, and she had an absolute BLAST! Hallie loves getting mail and I love supporting small businesses that endorse the importance of reading for kids! We just can’t wait to see what Ben has to say next! To learn more about Ben, check him out at www.bentherooster.com or on Facebook and Instagram!